A simple enough request, that above quoted closing statement from Yamanaka's will, and given that his contemporaries included Ozu Yasujirô, Shindô Kaneto and Mizoguchi Kenji, it's one that appears to have been positively responded to. And these were not the wishful words of an observer – Yamanaka also made good movies, perhaps great movies, but we have been left with tragically little evidence with which to judge this. Any talent cut short prompts a sad sense of what might have been, but the hand of fate really did deliver Yamanaka a slap. A young and prolific film-maker, he began his film career as a writer and assistant director at the age of 20, directing his first film a mere five years later. Between 1932 and 1937 he directed twenty-two features, the last of which was Ninjo kami fusen [Humanity and Paper Balloons]. The very day that the film was premiered, Yamanaka was drafted into the army and a year later died in a field hospital in Manchuria. During WW2, a combination of studio neglect and the devastation caused by allied bombing destroyed a large number of Japan's pre-war film output, including a dismaying nineteen of Yamanaka's features. Just three survive to this day. We can only be thankful that Ninjo kami fusen is one of them. Ninjo kami fusen is a jidaigeki, or period film (Yamanaka's specialisation), one that invites readings that take in not only Japan's feudal past but also its then pre-WW2 present. In a small town during the Edo period, a penniless samurai hangs himself. As the death is investigated, local gang boss Yatagoro's men are searching for ex-hairdresser Shinza, who has been organising gambling parties on the gangster's territory without his permission. Living next door to Shinza is Unno, a poor Ronin who is attempting to curry favour with local official Mori, whose present position of power is in part due to Unno's late father. Mori, meanwhile, is assisting wealthy local merchant Shirakoya, whose daughter is due to be married to the son of a noble samurai, but she is secretly in love with Shirakoya's clerk Chushichi. And this is just the set-up. Right from the start the story unfolds less through on-screen action than casual conversations between the local workers and tenants. The connections between the multi-stranded narrative are developed with disarming deftness – there is no introductory voice-over or title and some aspects of the story are already in full flow when the film begins and only become clear with the passing of time. Our first encounter with Shinza, for instance, sees him pursued by Yatagoro's men – we don't know who he or they are or why they are chasing him and are invited to piece together the information from sometimes offhand moments in scenes that follow, some of which, such as the drunken wake for the dead samurai, seem initially to be staged more for the fun of it than to advance the plot. Initially a busy ensemble piece in which the minor characters are given the same screen time as the leads, the main story threads develop simultaneously, as Unno's attempts to simply pass an introductory letter from his father to Mori are repeatedly rebuffed, Shirakoya's daughter and Chushichi grab what time they can together, and Shinza cheerfully ignores Yatagoro's warnings to cease gambling in his territory and continues to organise games. All three stories become entwined when Shinza, unable to raise money by pawning his hairdressing tools, kidnaps the young bride-to-be, the motivation for which proves to be not we are initially led to suspect. Made in collaboration with the left-wing Zenshin-za theatre group, the film offers a dim view of life for those on the lower rungs of the social ladder and directly challenges the more commonly held view of the Japanese warrior spirit you'll find in many a jidaigeki film. Here it is represented by three inglorious figures: an unseen nobleman who is picky about the social standing of the girl he marries; a self-important and ungrateful official; and a penniless and ineffectual ex-alcoholic who no longer seems able to defend himself in a fight. When you consider that the film was made in the lead-up to a world war in which that very warrior spirit was to prove a key aspect of Japan's fighting machine, this seems and extraordinarily bold and surprising move for any film of its place and time. As a character drama, Ninjo kami fusen unfolds beautifully, the offbeat character comedy eventually giving way to drama and tragedy. The performances, especially given the story's kabuki origins, are remarkably natural, while the camera placement and editing provide the film with its pace and a good deal of its emotional drive. An almost claustrophobic sense of community is created by shots angled down the narrow lane in which Shinza and Unno live, which is almost always busy with people Close-ups are rare and restricted to objects rather than people, but the 1.33:1 frame allows mid-shots to be used to surprisingly telling effect – at a key moment the camera lingers for far longer than you would expect on a static and rain-drenched Unno, his face a mask of crushed disappointment after blunt rejection from Mori. 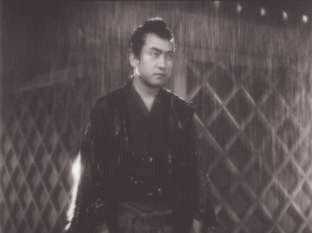 In the later stages Yamanaka uses intention and suggestion in place of literal action; it's a move that may well have been prompted by censorship issues of the time, but with its continued use by directors such as Kitano Takeshi this, together with the performances and the thematic boldness, can't help but give the film a sometimes disarmingly modern feel. Surprisingly, there is no incidental music at all, and silence itself is frequently used as a narrative tool. 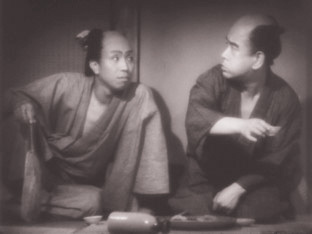 To lose a film-maker of Yamanaka's obvious talent is bad enough, but to lose most his cinematic legacy – including his first collaboration with Zenshin-za, Machi no Irezumi-mono (The Village Tattooed Man 1935), and Bangaku no issho (The Life of Bangaku 1933), a favourite of both Ozu and Shindô – seems downright tragic. That we still have Ninjo kami fusen is something to treasure, though, and the film is ripe now for rediscovery by a whole new generation of film enthusiasts. This transfer has been officially licensed from Toho in Japan, who have delivered here a bucket of mixed blessings. My initial reaction on seeing the transfer was one of slight disappointment. Contrast is the main issue, with the image often painted in shades of gray and solid blacks rarely in evidence. This can't help but give the image a sometimes washed-out look that suffers in comparison to restored prints of other films of this period (Eureka's own re-release of Fritz Lang's M is a prime example), and is actually atypical of DVD transfers of early black-and-white films. But there may be reasoning at work here. You have to remember that this is only one of three Yamanaka films that survived WW2, and it is extremely unlikely that Toho had pristine materials to work with. The image is generally on the soft side and detail in the shadow and highlight areas is not crisp, and seems likely that the transfer here is a deliberate attempt to retain detail that would probably be lost should the contrast be boosted. Inevitably there is some frame judder and image flickering in places, but although there is some minor damage visible, the real surprise is just how clean the print is – there is barely a dust spot or hair to be seen. There is the suspicion that with time and care this transfer could probably be improved on, specifically in its tonal range, but given the film's age and history, this is still a very watchable transfer. The original mono soundtrack has been transferred as one channel Dolby and does tend to show the film's age. There is a constant background hiss that is not unusual for films from this period, and a few pops and cracks due to print damage. The opening and performed music is considerably louder than the dialogue, which is sometimes very quiet, but after the wake scene you can safely crank the volume up without danger of being startled. The subtitles, translated by noted writer on Eastern cinema Tony Rayns, are clear throughout and removeable. The only on-disk extra here is a Gallery, which contains a reproduction of the original Japanese poster – which is also the DVD box and booklet cover, and 20 production stills of varying but generally very good quality. The stills are about half screen size. The best extra here is not on the DVD at all, but in the shape of a 24-page Booklet that includes essays on the film by Aoyama Shinji and Tony Rayns, Yamanaka's Diary of an Idle Man from 1935, a detailed essay on the director by Sato Kimitoshi and Yamanaka's last will and testament, which is quoted from at the top of this review. Despite my gripes regarding the contrast of the transfer, I am willing to concede that tweaking in this area may well result in a loss of detail that might negatively affect the clarity of some scenes, but I still can't help wondering if with the right amount of time and dedication (and, of course, funding) a crisper transfer might not be possible. No matter, Ninjo kami fusen is a captivating and beautifully told story that is rich in character detail and is made with a confidence and skill that belies the young age of its director, and leaves us aching for his lost films and those he might have gone on to make were in not for the cruelty of fate. So for the film itself, a largely unseen gem from the past now available for the appreciation and enjoyment of a discerning modern audience, and for the excellent accompanying booklet, this DVD comes recommended.